A ferry company's £100m flagship has developed a fault causing hundreds of holidaymakers to be left stranded. The 41,000-tonne Brittany Ferries' ship Pont-Aven entered service in March. The company had to cancel two fully-booked sailings between Plymouth and Roscoff in northern France when a cracked cooling valve was discovered. Brittany Ferries said the fault, found on Tuesday, caused no danger to anyone and passengers were being re-booked on other routes. The vessel is in Plymouth's Millbay Docks and is blocking the path of other boats. A routine inspection in Plymouth uncovered the crack in a seawater cooling valve. It resulted in water entering the engine compartment. Brittany Ferries said it would estimate the length of time needed to repair the valve once the extent of the damage had been established. The company's 2100 BST ferry to Plymouth has been diverted to Poole. Passengers are due to arrive at 0100 BST on Wednesday. 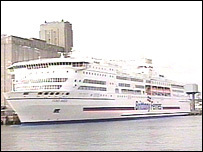 The Pont-Aven is the largest ferry in the company's fleet. It carries 2,400 passengers and 650 cars.